JRC is thrilled to be hosting TheVent in March. We will welcome 175+ Jewish teens from Maryland to North Carolina, to our synagogue and to our homes. Our local youth groupers, DRTY, are hard at work developing the programming for the weekend. What’s in it for JRC teens? 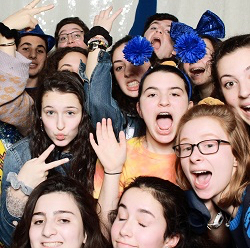 Meet new people and see their friends from NFTY, Camp, Israel and Mitzvah Corps. Wrestle with hot topics and challenge their assumptions during interactive teen-led programs. Participate in our annual sub region Color War! What’s in it for the congregation? Join us for Friday night services, led by the teens to see how passionate they are about Jewish life. Volunteer to host teens in your home for the weekend (which includes opportunities to eat with them and drive them to/from JRC) and get to know new people from our same Reform movement. 8th-12th graders: Register here. Scholarships are available from NFTY and JRC, contact Rena at rfraade@judeareform.org for information. Adults: Interested in hosting 3 or more teens in your house? Contact Betsy at bepojo932@gmail.com or Isabel at irgeffner@gmail.com for specific requirements.